Hennessey Performance last year unveiled a Chevrolet Camaro ZL1 with 1000 horses named the Exorcist and put the car up for the challenger against the then upcoming Dodge Demon. it’s a bit of apples and pears comparison scenario, with an aftermarket modded vehicle and the Demon coming straight from the factory, but the Exorcist still could prove 959hp hit the floor. Until now, we knew the power ratings but not the top speed. 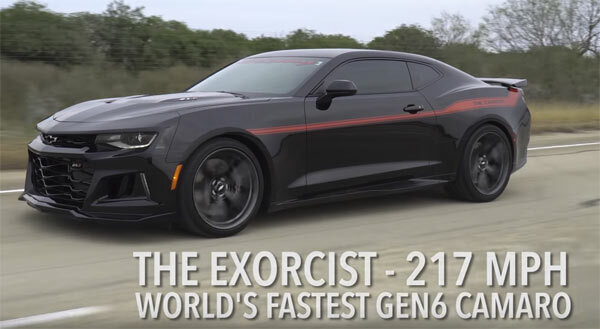 This video was recently released by Hennessey, showing the Exorcist Camaro ZL1 hitting a top speed of 217 mph. Compared to the Dodge Demon which hits 203 mph, but is electronically limited. The top speed run of the Camaro was done by Brian Smith from the Ford Performance School at the Continental Uvalde Proving Grounds. The clear one-mile straight on the track is where the Camaro hit its mark and of all the comparisons are towards the Dodge Demon, it’s more of going down the court to more expensive supercars like the McLaren P1 and Ferrari offerings. The Ferrari LaFerrari may hit 221 mph, but you’ll have to are far deeper pockets. ← Previous Story Daddy Dave With Goliath At Lights Out 9!